In EM13cR1, it was the first time when the Oracle Database Backup Service was integrated . In Release 2 the configuration menu was extended, a storage container can be defined now e.g. for a better organization and overview of the backups. 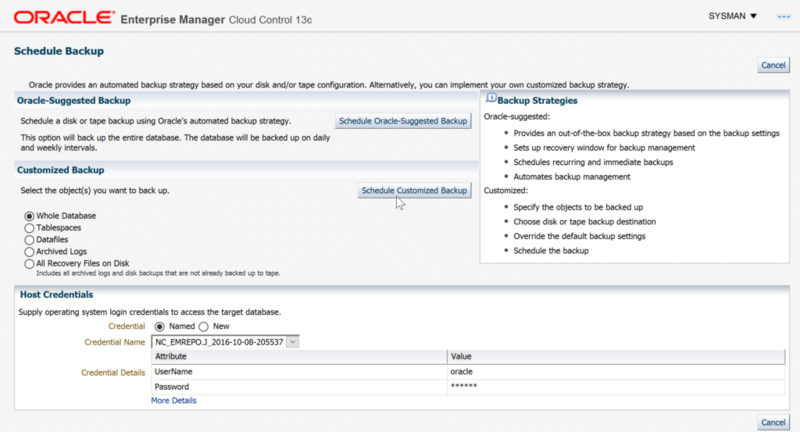 This blog post shows you how to configure the Oracle Database Backup Service in Enterprise Manager 13cR2 and how to prepare a database for a cloud backup. All you need is the Oracle Database Backup Service, a trial works too. Enter your domain and login information. Optional: Set a backup container. A backup container is an organiziation unit like a subdirectory on a server. 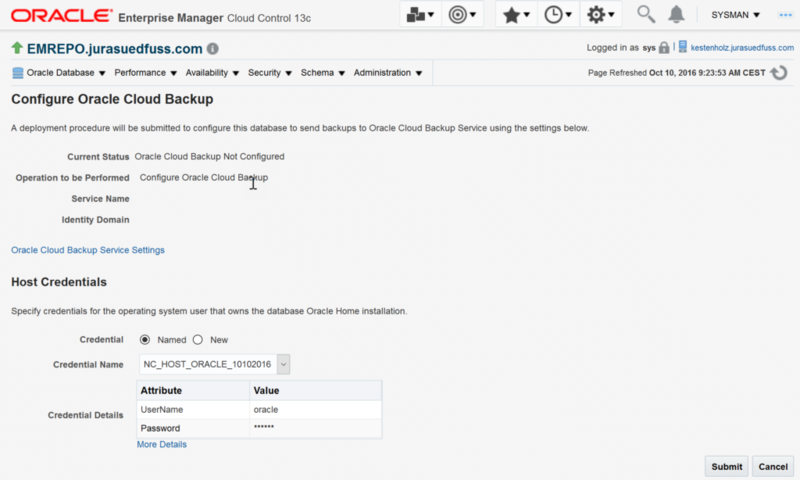 Select the database which you want to backup to the Oracle cloud from the database target page. Configure Oracle Cloud Backup Service. The first time when you run the configuration, you need to enter your host credentials for the host where the database is running which you want to configure. Use the username which has installed the database software, or you can use a named credential. Be sure that the server where the backup has to be configured has access to the internet. After submit, a deployment procedure configures the Oracle Database Backup Service on the server. The Oracle Database Backup Service module will be installed on server. The deployment procedure copies the tape library for the Oracle Database Backup Service into the $ORACLE_HOME/lib and creates a wallet in $ORACLE_HOME/dbs/opc with the cloud certficates. Bot components are required to use the service. The EM13c view after the successful deployment. 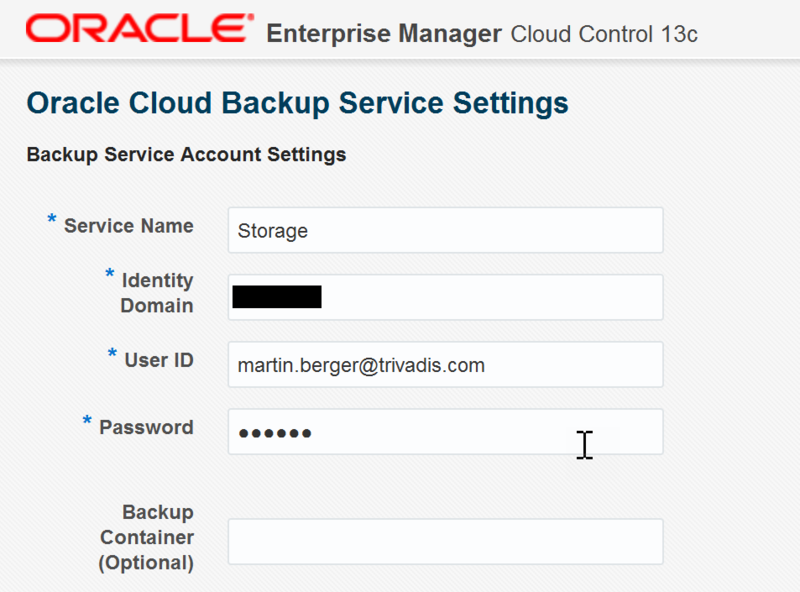 To verify the configuration, press the Test Oracle Cloud Backup Button. All backups into the Oracle Cloud have to be encrypted, the test run too. 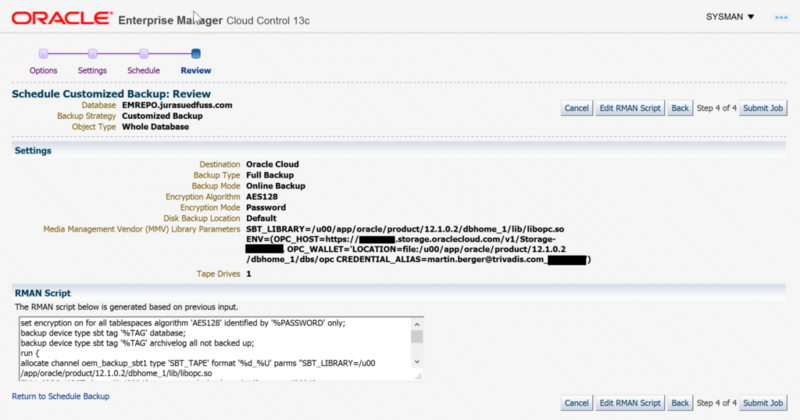 Now you are able to backup an Oracle database with RMAN into the Oracle Cloud. Schedule a backup. On the backup settings page, scroll down to set the encryption mode. You can choose between the wallet and the password method. 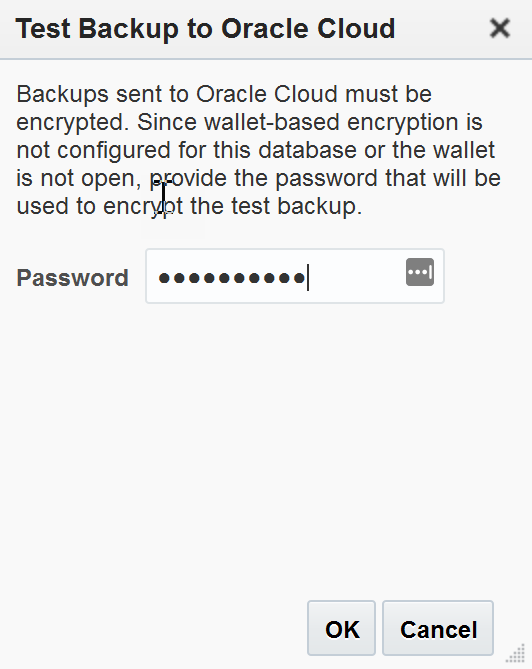 For more information how to configure a wallet for a backup, take a look at my blog post here: Encrypt RMAN Backups for the Oracle Cloud with a Keystore. As reminder, database backups with target Oracle Cloud have to be encrypted locally. Otherwise the backup job fails. Activate the checkbox for the password method and set/confirm the password. Next. Select the Oracle Cloud as destination. Below you can see the used RMAN parameter. Oracle uses the file libopc.so like a tape driver. Next. Now you can submit the job or use the syntax in the RMAN script box. The Oracle Database Backup Service is fully integrated in the Oracle Enterprise Manager 13c and it works fine. The EM deploys you the Oracle backup module on the target servers, once deployed, the configuration can be used for every other database which runs on the same target host as configured.